This article is about the first generation Chevrolet Corvette (C1). For general Corvette information, see Chevrolet Corvette. The Chevrolet Corvette (C1) is the first generation of the Corvette sports car produced by Chevrolet. It was introduced late in the 1953 model year, and produced through 1962. It is commonly referred to as the "solid-axle" generation, as the independent rear suspension did not appear until the 1963 Sting Ray. The Corvette was rushed into production for its debut model year to capitalize on the enthusiastic public reaction to the concept vehicle, but expectations for the new model were largely unfulfilled. Reviews were mixed and sales fell far short of expectations through the car's early years. The program was nearly canceled, but Chevrolet would ultimately stay the course. In 1927 General Motors hired designer Harley Earl who loved sports cars. GIs returning after serving overseas in the years following World War II were bringing home MGs, Jaguars, Alfa Romeos, and the like. In 1951, Nash Motors began selling an expensive two-seat sports car, the Nash-Healey, that was made in partnership with the Italian designer Pininfarina and British auto engineer Donald Healey, but there were few moderate-priced models. Earl convinced GM that they needed to build a two-seat sports car, and with his Special Projects crew began working on the new car, "Project Opel" in late 1951. The result was the hand-built, EX-122 pre-production Corvette prototype, which was first shown to the public at the 1953 General Motors Motorama at the Waldorf-Astoria in New York City on January 17, 1953. Production began six months later. The car is now located at the Kerbeck Corvette museum in Atlantic City and is believed to be the oldest Corvette in existence. To keep costs down, GM executive Robert F. McLean mandated off-the-shelf mechanical components, and used the chassis and suspension design from the 1949–1954 Chevrolet passenger vehicles. The drivetrain and passenger compartment were moved rearward to achieve a 53/47 front-to-rear weight distribution. It had a 102-inch wheelbase. The engine was a 235 cu in (3.85 L) inline six engine that was similar to the 235 engine that powered all other Chevrolet car models, but with a higher-compression ratio, three Carter side-draft carburetors, mechanical lifters, and a higher-lift camshaft. Output was 150 horsepower (110 kilowatts). Because there was currently no manual transmission available to Chevrolet rated to handle 150 HP, a two-speed Powerglide automatic was used. 0–60 mph (0–97 km/h) time was 11.5 seconds. During the last half of 1953, 300 Corvettes were to a large degree, hand-built on a makeshift assembly line that was installed in an old truck plant in Flint, Michigan while a factory was being prepped for a full-scale 1954 production run. The outer body was made out of then-revolutionary glass fiber reinforced plastic material. Although steel shortages or quotas are sometimes mentioned as a factor in the decision to use fiberglass, no evidence exists to support this. In calendar years 1952 and 1953 Chevrolet produced nearly 2 million steel bodied full-size passenger cars and the intended production volume of 10,000 Corvette for 1954 was only a small fraction of that. The body on the show model was made of reinforced plastic purely as an expedient to get the job done quickly. Although we were going ahead with the building of an experimental plastic body in order to get a car rolling for chassis development work – at the time of the Waldorf Show, we were actually concentrating body-design-wise on a steel body utilizing Kirksite tooling for the projected production of 10,000 units during the 1954 model year. It was some time later that we decided to produce this quantity in reinforced plastic. About this time, some doubt was expressed that we should build the 1954 model of steel. People seemed to be captivated by the idea of the fiberglass plastic body. Furthermore, information being given to us by the reinforced plastic industry seemed to indicate the practicality of fabricating plastic body parts for automobiles on a large scale. A 55 degree raked windshield was made of safety glass, while the license plate holder was set back in the trunk, covered with a plastic window. Underneath the new body material were standard components from Chevrolet's regular car line, including the "Blue Flame" inline six-cylinder engine, two-speed Powerglide automatic transmission, and drum brakes. The engine's output, 136 hp (101 kW), was increased however from a Carter triple-carburetor system exclusive to the Corvette, but performance of the car was decidedly "lackluster". Compared to the British and Italian sports cars of the day, the Corvette lacked a manual transmission and required more effort to bring to a stop, but like their British competition, such as Morgan, was not fitted with roll-up windows; this would have to wait until sometime in the 1956 model year. A Paxton centrifugal supercharger became available in 1954 as a dealer-installed option, greatly improving the Corvette's straight-line performance, but sales continued to decline. The Chevrolet division was GM's entry-level marque. Managers at GM were seriously considering shelving the project, leaving the Corvette to be little more than a footnote in automotive history, and would have done so if not for three important events. The first was the 1955 introduction of Chevrolet's first V8 engine since 1919. Late in the model year, the new 195 hp (145 kW) 265 small-block became available with a Powerglide automatic transmission, until the middle of the production year when a manual 3-speed became available, coupled to a 3.55:1 axle ratio, the only one offered. The engine was fitted with a single 2218S or 2351S WCFB four-barrel (four-choke) Carter carburetor. The combination turned the "rather anemic Corvette into a credible if not outstanding performer". The second was the influence of a Russian émigré in GM's engineering department, Zora Arkus-Duntov. The third factor in the Corvette's survival was Ford's introduction of the 1955 two-seat Thunderbird, which was billed as a "personal luxury car", not a sports car. Even so, the Ford-Chevrolet rivalry in those days demanded GM not appear to back down from the challenge. The original concept for the Corvette emblem incorporated an American flag into the design, but was changed well before production since associating the flag with a product was frowned upon. The 1953 model year was not only the Corvette's first production year, but at 300 produced it was also the lowest-volume Corvette. The cars were essentially hand-built and techniques evolved during the production cycle, so that each 1953 Corvette is slightly different. All 1953 models had Polo White exteriors, red interiors, and black canvas soft tops. Order guides showed heaters and AM radios as optional, but all 1953 models were equipped with both. Over two hundred 1953 Corvettes are known to exist today. They had independent front suspension, but featured a rigid axle supported by longitudinal leaf springs at the rear. The cost of the first production model Corvettes in 1953 was $3490. The quality of the fiberglass body as well as its fit and finish was lacking. Other problems, such as water leaks and doors that could open while the car was driven, were reported with the most severe errors corrected in subsequent units produced, but some shortcomings continued beyond the Corvette's inaugural year. By December 1953, Chevrolet had a newly equipped factory in St. Louis ready to build 10,000 Corvettes annually. However, negative customer reaction in 1953 and early 1954 models caused sales to plummet. In 1954, only 3,640 of this model were built and nearly a third were unsold at year's end. New colors were available, but the six-cylinder engine and Powerglide automatic, the only engine and transmission available, were not what sports car enthusiasts expected. It is known that 1954 models were painted Pennant Blue, Sportsman Red, and Black, in addition to Polo White. All had red interiors, except for those finished in Pennant Blue which had a beige interior and beige canvas soft top. Order guides listed several options, but all options were "mandatory" and all 1954 Corvettes were equipped the same. In the October 1954 issue of Popular Mechanics there was an extensive survey of Corvette owners in America. The surprising finding was their opinions in comparison to foreign sports cars. It was found that 36% of those taking the survey had owned a foreign sports car, and of that, half of them rated the Corvette as better than their previous foreign sports car. Nineteen percent rated the Corvette as equal to their foreign sports car and 22% rated the Corvette as inferior. While many were well pleased with the Corvette, they did not consider it as a true sports car. The principal complaint of the surveyed owners was the tendency of the body to leak extensively during rain storms. Chevrolet debuted its 265 cu in (4.34 L) small-block, 195 hp (145 kW) V8 in 1955 and the engine found its way into the Corvette. At first 1955 V8 Corvettes continued with the mandatory-option Powerglide automatic transmission (as did the few 6-cylinder models built), but a new three-speed manual transmission came along later in the year for V8 models only. Exterior color choices were expanded to at least five, combined with at least four interior colors. Even soft-tops came in three colors and different materials. Despite all this, only 700 1955 Corvettes were built, making it second only to 1953 in scarcity. Very few six-cylinder 1955 models were built, and all documented examples are equipped with automatic transmissions. The "V" in the Corvette emblem was enlarged and gold colored, signifying the V8 engine under the hood and 12 volt electrical systems, while 6-cylinder models retained the 6-volt systems used in 1953-54. Rare option estimate: Manual transmission (75). Although not a part of the original Corvette project, Zora Arkus-Duntov was responsible for the addition of the V8 engine and three-speed manual transmission. Duntov improved the car's marketing and image and helped the car compete with the new V8—engined Ford Thunderbird, and turned the Corvette from its lackluster performance into a credible performer. In 1956 he became the director of high-performance vehicle design and development for Chevrolet helping him earn the nickname "Father of the Corvette." Although the C1 Corvette chassis and suspension design were derived from Chevrolet's full-size cars, the same basic design was continued through the 1962 model even after the full-size cars were completely redesigned for the 1955 model year. This was due to the combined factors of the relatively high re-engineering and re-tooling costs for this low-volume production vehicle, the continued potential for cancellation of the car, and the increased size and weight of the all-new suspension design for the full-size cars, which made it unsuitable for use in the lighter weight Corvette. There was no doubt Chevrolet was in the sports car business with the release of the 1956 model. It featured a new body, a much better convertible top with power assist optional, real glass roll up windows (also with optional power assist) and an optional hardtop. The 3-speed manual transmission was standard. The Powerglide automatic was optional. The six-cylinder engine was gone. The V8 remained at 265 cu in (4.3 L), but power ranged from 210 to 240 hp (157 to 179 kW). The volume was 3,467, a low number by any contemporary standard and still less than 1954s 3,640, meaning this was the third lowest-volume model in Corvette history. Delco Radio transistorized signal-seeking (hybrid) car radio, which used both vacuum tubes and transistors in its radio's circuitry (1956-57 option). Rare options: RPO 449 special camshaft with the 240 hp (179 kW) engine (111), RPO 426 power windows (547). Visually the 1957 model was a near-twin to 1956. Engine displacement increased to 283 cu in (4.6 L), fuel injection became optional and a 4-speed manual transmission was available after April 9, 1957. Fuel injection first saw regular use on a gasoline engine two years prior on the 1955 Mercedes-Benz 300SL "Gullwing". Although the Corvette's GM-Rochester mechanical fuel injection used a constant flow system, as opposed to the diesel style nozzle metering system of the Mercedes', the Corvette's engine nevertheless produced about 290 hp (216 kW). This was underrated by Chevrolet's advertising agency for the 283 hp (211 kW) at 6200 rpm and 290 lb⋅ft (393 N⋅m) of torque at 4400 rpm 283 cu in (4.6 L) small-block V8 engine "One HP per cubic inch" (1 hp (0.75 kW) per 1 cu in (16 cc)) slogan, making it one of the first mass-produced engines in history to reach 1 hp/in³. Pushed toward high-performance and racing, principally by Zora Arkus-Duntov who had raced in Europe, 1957 Corvettes could be ordered ready-to-race with special options. Fuel injection was in short supply and 1,040 Corvettes with this option were sold. Rare options: RPO 579E 283 hp (211 kW) engine with fresh air/tach package (43), RPO 684 heavy-duty racing suspension (51), RPO 276 15 by 5.5 in (380 by 140 mm) wheels (51), RPO 426 power windows (379), RPO 685 4-speed transmission (664). In an era of chrome and four headlamps, the Corvette succumbed to the look of the day. The 1958 model year and the four that followed all had the exposed four-headlamp treatment and prominent grilles, but a faux-louvered hood and chrome trunk spears were unique to 1958. The interior and instruments were updated, including placing a tachometer directly in front of the driver. For the 1958 model, an 8000 rpm tachometer was used with the 270 hp (200 kW) and 290 hp engines, rather than the 6000 rpm units used in the lower horespower engines. Optional engine choices included two with twin carburetors (including a 270 hp model with Carter 2613S and 2614S WCFB four-barrels) and two with fuel injection. Power output for the highest rated fuel-injected engine was 290 hp. Displacement remained 283 cid. For the first time, seat belts were factory-installed rather than being dealer-installed as on previous models. Rare options were RPO 684 heavy-duty brakes and suspension (144), RPO 579 250 hp engine (554), RPO 276 15"×5.5" wheels (404). For the 1959 model, engines and horsepower ratings did not change. Interiors were revised slightly with different instrument graphics and the addition of a storage bin to the passenger side. A positive reverse lockout shifter with "T" handle was standard with 4-speed manual transmission. This was the only year a turquoise convertible top color could be ordered, and all 24-gallon fuel tank models through 1962 could not be ordered with convertible tops due to inadequate space for the folding top mechanism. Rare options: RPO 684 heavy-duty brakes and suspension (142), RPO 686 metallic brakes (333), RPO 276 15"×5.5" wheels (214), RPO 426 power windows (547), RPO 473 power convertible top (661). Last features to appear in 1960 models included tailamps molded into the rear fenders and heavy grill teeth. New features include aluminum radiators, but only with 270 hp and 290 hp engines. Also for the first time, all fuel-injection engines required manual transmissions. The 1960s Cascade Green was metallic, unique to the year and the rarest color at 140 made. Rare options: RPO 579 250 hp engine (100), RPO 687 heavy-duty brakes and suspension (119), RPO 276 15"×5.5" wheels (246), RPO 473 power convertible top(512), RPO 426 power windows (544). Four taillights appeared on the 1961, a treatment that continues to this day. Engine displacement remained at 283 cubic inches, but power output increased for the two fuel-injected engines to 275 and 315 hp (205 and 235 kW). Power ratings for the dual-four barrel engines did not change (245 hp and 270 hp) but this was the last year of their availability. This was the last year for contrasting paint colors in cove areas, and the last two-tone Corvette of any type until 1978. Also debuting in 1961 was a new boat-tail design later used on the C2. Rare options: RPO 353 275 hp engine (118), RPO 687 heavy-duty brakes and steering (233), RPO 276 15"×5.5" wheels (357), RPO 473 power convertible top (442). The 1962 model year was the last Corvette with a solid-rear-axle suspension that was used from the beginning. With two new engines it was also the quickest. Engine displacement increased with the introduction of the 327 cu in (5,360 cc) engine, but dual 4-barrel carburetor engines were no longer available. Hydraulic valve lifters were used in the base 250 hp and optional 300 hp (220 kW) engines, solid lifters in the optional carbureted 340 hp and fuel-injected 360 hp (270 kW) versions. Rocker panel trim was seen for the first time, exposed headlights for the last, until 2005. This was the last Corvette model to offer an optional power convertible top mechanism. Rare options: RPO 488 24-gallon fuel tank (65), RPO 687 heavy-duty brakes and steering (246), RPO 473 power convertible top (350), RPO 276 15"×5.5" wheels (561). 1958 9,168 $3,591 Quad-headlight body and new interior. Fake-louvers on hood and chrome strips on trunk lid. Number of teeth in grille reduced from thirteen to nine. 1959 9,670 $3,875 First black interior and dash storage bin; only year with a turquoise top. Louvres and chrome strips from '58 removed. 1961 10,939 $3,934 New rear styling, bumpers, and round taillights. New fine-mesh grill. 1962 14,531 $4,038 327ci V8 engine; last year with a trunk until 1998 and last year with exposed head lights until 2005. New black grill with chrome surround, chrome rocker panel moldings. ^ a b "1955 Corvette Brochure". Oldcarbrochures.com. p. 4. Retrieved 2013-01-28. ^ a b c d e f Prince, Richard (2002). Corvette Buyers Guide, 1953-1967. MotorBooks/MBI Publishing. ISBN 978-0-7603-1009-0. Retrieved 2010-10-22. ^ Leffingwell, Randy; Newhardt, David (2005). Mustang. MotorBooks/MBI Publishing. p. 13. ISBN 978-0-7603-2183-6. Retrieved 2013-01-28. ^ Adler, Dennis (2004). Fifties Flashback. MotorBooks/MBI Publishing. p. 145. ISBN 978-0-7603-1927-7. Retrieved 2013-01-28. ^ a b Leffingwell, Randy (2002). Corvette: America's Sports Car. MotorBooks/MBI Publishing. pp. 14–19. ISBN 978-0-7603-1352-7. ^ "EX122 Motorama Experimental Protocol". Kerbeck Corvette. Archived from the original on 20 February 2009. Retrieved 26 April 2009. ^ Teeters, K. Scott (20 February 2014). "1953 Chevrolet Corvette Blue Flame Six - "Corvette's First Engine"". Super Chevy. Retrieved 12 September 2016. ^ a b Premo, Ellis (1954). "The Corvette Plastic Body". Society of Automotive Engineers. SAE International. 540257. Retrieved 28 September 2014. ^ a b c d e f g h i Antonick, Mike (November 1999). 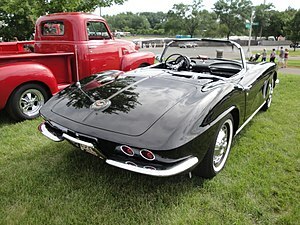 Corvette Black Book 1953-2000. Powell, Ohio: Michael Bruce Associates, Inc. ISBN 0933534469. ^ a b "1953 Corvette Foldout". Oldcarbrochures.com. p. outside. Retrieved 2013-01-28. ^ Mueller, Mike (2003). Classic Corvette 30 Years. Crestline Imprints. p. 40. ISBN 978-0-7603-1806-5. Retrieved 2010-10-22. ^ Ries, Al (2005). Focus: The Future of Your Company Depends on It. HarperCollins. p. 204. ISBN 978-0-06-079990-8. ^ Baker, Ronald J. (2006). Pricing on Purpose: creating and capturing value. John Wiley and Sons. p. 89. ISBN 978-0-471-72980-8. Retrieved 2010-10-22. ^ McLellan, Dave (2002). Corvette from the Inside. Bentley Publishers. p. 20. ISBN 978-0-8376-0859-4. Retrieved 2010-10-22. ^ a b c d e f g h i Antonick, Mike (2001). Corvette Price Handbook 2002: 1953-1995 Models With Web Updates. Motorbooks International. ISBN 9780933534506. Retrieved 13 September 2016. ^ "Here Comes the Corvettes." Popular Mechanics, December 1953, pp. 82-83. ^ a b c d e Gunnel, John, ed. (1987). The Standard Catalog of American Cars 1946-1975. Krause Publications. ISBN 0-87341-096-3. ^ "Corvette Is A Fine Fun Car But It Has Its Limitations." Popular Mechanics, October 1954, pp. 118-122/356. ^ Mueller, Mike (2000). Corvette, 1968-1982. MotorBooks/MBI Publishing. p. 94. ISBN 978-0-7603-0418-1. ^ "1956 Corvette Brochure". Oldcarbrochures.com. p. 4. Retrieved 2013-01-28. ^ Mueller, Mike (2012). The Complete Book of Corvette: Every Model Since 1953. St. Paul, Minn.: Motorbooks. ISBN 9780760341407. Retrieved 14 September 2016. ^ "1956 Chevrolet Corvette, 1957 MY 2934". Carfolio.com. 2013-02-28. Retrieved 2018-08-01. Holmes, Mark (2007). Ultimate Convertibles: Roofless Beauty. London: Kandour. pp. 52–53. ISBN 978-1-905741-62-5. Wikimedia Commons has media related to Chevrolet Corvette C1. "Corvettes at Le Mans: GM Shows off rare 1960 Documentary". GM Media Archives. Archived from the original on 1 June 2010. Retrieved 29 May 2010. "Vehicle Information Kits". GM Heritage Center. Retrieved 14 September 2016. This page was last edited on 19 February 2019, at 11:24 (UTC).